It was one of the most bizarre stories in Russian football. National team players Aleksandr Kokorin and Pavel Mamaev were arrested and sentenced to jail sentences after having gone on a rampage in Moscow. Kokorin’s Zenit had hosted Mamaev’s Krasnodar in the Russian Premier Liga top match in October. Zenit ultimately won the game 2-1, but the result would soon disappear from the headlines. Because Kokorin and Mamaev, who are close friend of the pitch went on a trip to Moscow to celebrate the result. In their drunken fury, they have been involved in a drunken attack on Russian Trade Ministry official Denis Pak, resulting in Pak requiring medical attention. But that was not enough. Hours before that accident, Mamaev, Kokorin and other young people were involved in an altercation with the driver of a Channel One show presenter; in the altercation, he received brain damage, a nose fracture and face contusions after numerous punches. The incident caused outrage in Russia and open debate over the above the law attitude of the wealthy in Russia. In this case, the footballers may have tangled with people that were above them in status, and as a result, the players received heavy fines from their clubs and were apprehended for two months, which was extended to another two months in early February. 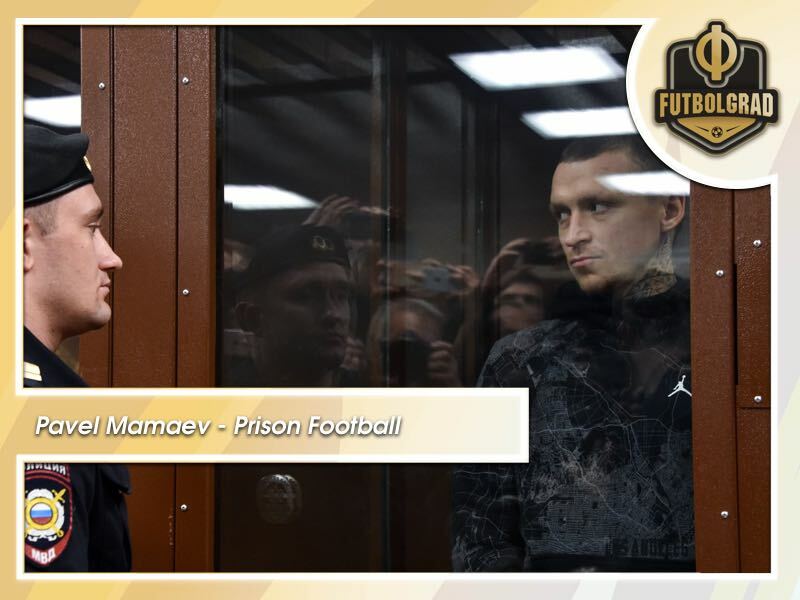 Now on Valentines Day Pavel Mamaev played a heavily advertised game of football with his cellmates. The game lasted two times 20 minutes because the match was held during the daily one-hour of recreational time for prisoners at the Butyrka prison. Pavel Mamaev ended up playing both teams, one half each. He also received a bib with the #17 and his last name. In the end, the game ended 8-7, and he scored seven out of the 15 goals. One of the goalies was black which caused some jokes for the foreigner rule and agent’s dealing that they brought a new prospect. The press was allowed to watch the match. There is a video of the full match. The game looks like a normal winter match in the park that can be seen all over Moscow at this time of the year. But the quality was poor because the other players were not very good and the match was played on snow. Meanwhile, his friend Kokorin did not take part as his contract with Zenit prohibited him from playing the game. Pavel Mamaev wanted the game to take place on Valentines Day so that he could dedicate this match to his wife and the wives of all other jailed people who are still waiting for their husbands. But Pavel Mamaev is not the first jailed Russian player to become famous for playing football while being incarcerated. The famous Starostin brothers were able to ease their harsh Gulag sentences by coaching and playing for Gulag teams in the 1940s under the brutal Stalin regime.